ROCKY LANE WESTERN #1 (see WC #97, pg. 7) was issued by Fawcett in May ‘49 and continued on a monthly basis through #55 (1/54) at which time Fawcett Comics folded (due to litigation by DC against Fawcett’s Capt. Marvel feature copying Superman) and Charlton picked up Rocky with #56 on through #87 (11/59). 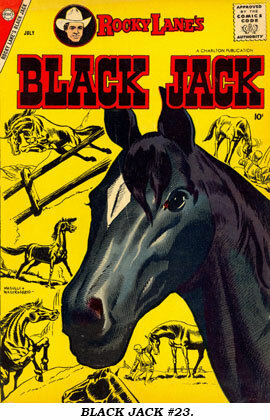 Art in the BLACK JACK Charlton Comics was often by the adequate Maurice Whitman, as well as Medio Iorio, Sal Trapani, Mastroserio and Masulli, Charles Nicholas, even Steve Ditko. #22 was a Giant 68 page 15¢ issue. 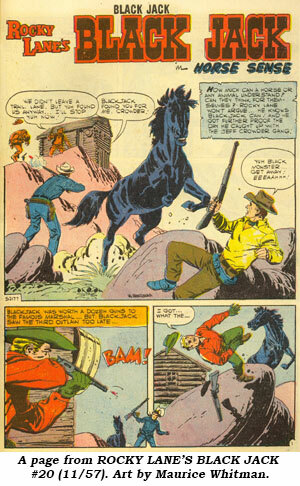 As with most Charlton comics, the art became more methodical as the series progressed. 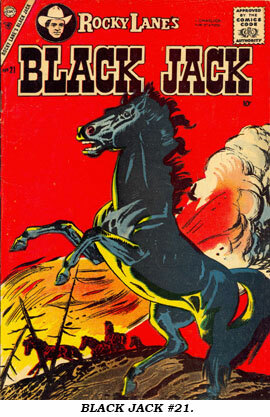 Back-up non-Black Jack stories were drawn by Al Williamson/Angelo Torres; Pete Morisi; Joe Maneely, and Steve Ditko. The series ended with #30 in November 1959. In Fine #27 commands $27 with the rest in the $18-$24 range.